Compare prices on car hire in Biarritz from all the major brands and find the best deals. When you book through us, unlimited mileage and insurance are always included in the price given. Biarritz is situated on the French Atlantic coast – specifically in the Bay of Biscay, near the border with Spain . Administrative belong to the city Department Pyrenees Atlantique region Aquitaine. Biarritz, which has 26,690 inhabitants (2006), is also part of the historic “Basque Country”, which covers a large area on both sides of the Franco-Spanish border. 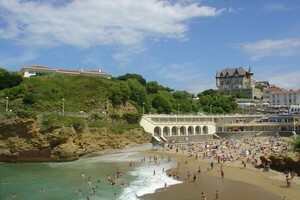 Biarritz is primarily known as a spa and resort, and hotel complexes along the beaches has a luxury feel. There is also a paradise for surfers. Several of the sites linked to its position at sea. It applies, for example. the popular Musee de la Mer, where there are 24 tanks (including the sharks and seals). The city also has more special attractions such as its own chocolate museum (Musée de Chocolat) and the Asian Art Museum (Asiatica), with works of art from India , Nepal, Tibet and Airways. The nearest airport is Aéroport Biarritz-Anglet-Bayonne, which is a few miles east of downtown.